Join the Wooldand Gang online! Meet the gang and find further adventures at their HQ, the Treehouse. 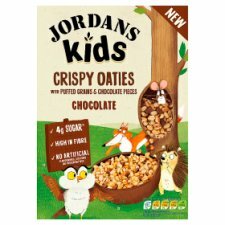 *Jordans Kids Chocolate is a source of iron and high in phosphorus. Iron contributes to the normal function of the immune system and phosphorus contributes to the maintenance of normal bones and teeth when consumed as part of a balanced diet and healthy lifestyle. Tell us what you think of Jordans Kids. We hope you love it like we do, but if you're not happy we will do whatever we can to help. Store in a cool, dry place and give this box a shake before pouring. Once opened roll down the bag and tuck in the flap.